Over 30 years ago I began writing an original Christmas story as my annual gift to the congregation. I distributed these original stories to everyone who attended our Christmas Eve worship services. These tales were always well-received, and eventually my annual Christmas story became a tradition. As the years passed, Christmas began to take on a different feeling for our family, too—especially as children grew into adults and the size of our family gatherings began to diminish year by year, with travel constraints and health issues seeming to rise to the forefront instead of the expectation of joy and celebration. And then, several years ago, I began to realize that many people experienced Christmas as a “blue” season—a series of days tinged with painful memories, or isolation, or anxieties. I wanted to do something to help. And that’s when our congregation began its “Blue Christmas” tradition. Each year, we would gather for prayer and worship a few days before Christmas Eve—a time to acknowledge in an honest and worshipful atmosphere those realities we associated with our personal and familial losses and our grief. This “Blue Christmas” worship service was more well-received than my annual Christmas stories and has become one of the most welcome features of our Christmas celebration in the congregation. It is our new tradition. At Blue Christmas, people can pour out their honesty and pain without fear of being judged or regarded as a killjoy. These honest feelings and experiences were the compelling reason I wanted to write Blue Christmas. I hope that the devotions, prayers, readings, and questions for personal reflection and group study will be a blessing to all who find themselves walking through a dark season looking for the light. I hope that others will find the reflections in this book to be an honest approach to a season full of activities that can, at times, disguise our deeper pain and anguish. Mostly, I trust that the book will be a hopeful guide to finding God’s peace in the midst of our pain. I believe Blue Christmas will help those who, for various reasons, struggle to find new wonder and delight in a world that can often leave us in the dark. At some level, young and old alike find themselves feeling blue during times when so many people seem wrapped up in joyous celebration. These feelings often fuel our loneliness and despair. Likewise, I hope that the book can also bring people together to discuss these matters in small groups and classes. Blue Christmas can be the type of Advent study that offers support and hopeful dialogue. And the questions can serve as a guide to group discussion or personal reflection. Finally, my hope was that church leaders and pastors would also find the Blue Christmas worship service and the prayers to be a valuable resource in those congregations that might wish to begin their own Blue Christmas tradition. Bringing people together to find hope in the darkness is a gentle reminder that the church is a family of God—and that people are more willing to hear each other’s stories than we might think. In the end, Blue Christmas is a simple book with a profound message. The gospel of Christ speaks most powerfully to us, not in those times when we are elated and successful, but during the dark nights of the soul, when we experience loss, hopelessness, and defeat. We can still know the profound gospel of Christmas in our pain and our anguish—and these are, in fact, the times when the gospel comes most powerfully alive to us. I hope readers will gain something both personal and profound when they read Blue Christmas and take to heart the simple message of God’s love for the world. 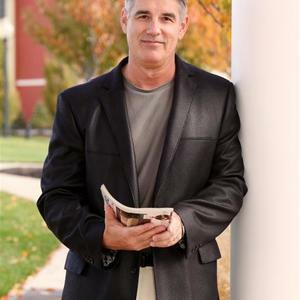 Todd Outcalt is the lead pastor of Calvary United Methodist Church in Brownsburg, Indiana. He enjoys traveling, hiking, and painting. To learn more about Blue Christmas, click here. The Upper Room invites you to participate in a Blue Christmas prayer service by watching the video below. A “Blue Christmas” service may also be known as the “Longest Night” service. This service is especially designed to give voice and hope to those who are grieving or who are experiencing loss. Join us in this prayer service, lifting up any darkness you may feel to the God of Light.